Until the current epidemic, Ebola was largely regarded as not a Western problem. Although fearsome, Ebola seemed contained to remote corners of Africa, far from major international airports. We are now learning the hard way that Ebola is not—and indeed was never—just someone else’s problem. Yes, this outbreak is different: it originated in West Africa, at the border of three countries, where the transportation infrastructure was better developed, and was well under way before it was recognized. But we should have understood that we are “all in this together” for Ebola, as for any, infectious disease. Understanding that we were profoundly wrong about Ebola can help us to see ethical considerations that should shape how we go forward. Here, I have space just to outline two: reciprocity and fairness. In the aftermath of the global SARS epidemic that spread to Canada, the Joint Centre for Bioethics at the University of Toronto produced a touchstone document for pandemic planning, Stand on Guard for Thee, which highlights reciprocity as a value. When health care workers take risks to protect us all, we owe them special concern if they are harmed. Dr. Bruce Ribner, speaking on ABC, described Emory University Hospital as willing to take two US health care workers who became infected abroad because they believed these workers deserved the best available treatment for the risks they took for humanitarian ends. Calls to ban the return of US workers—or treatment in the United States of other infected front-line workers—forget that contagious diseases do not occur in a vacuum. Even Ann Coulter recognized, in her own unwitting way, that we owe support to first responders for the burdens they undertake for us all when she excoriated Dr. Kent Brantly for humanitarian work abroad rather than in the United States. We too often fail to recognize that all the health care and public health workers at risk in the Ebola epidemic—and many have died—are owed duties of special concern. Yet unlike health care workers at Emory, health care workers on the front lines in Africa must make do with limited equipment under circumstances in which it is very difficult for them to be safe, according to a recent Wall Street Journal article. As we go forward we must remember the importance of providing adequately for these workers and for workers in the next predictable epidemics — not just for Americans who are able to return to the US for care. Supporting these workers means providing immediate care for those who fall ill, as well as ongoing care for them and their families if they die or are not longer able to work. But this is not all; health care workers on the front lines can be supported by efforts to minimize disease spread—for example conducting burials to minimize risks of infection from the dead—as well as unceasing attention to the development of public health infrastructures so that risks can be swiftly identified and contained and care can be delivered as safely as possible. Ebola in West Africa. 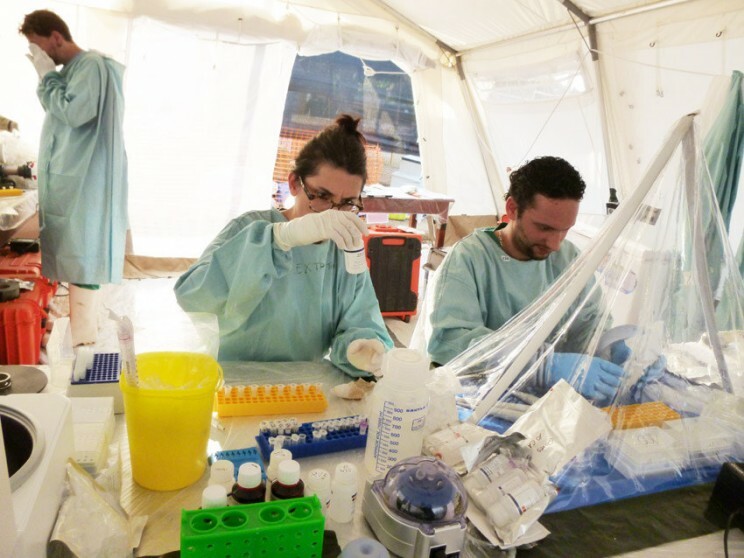 Three humanitarian experts and six specialists in dangerous infectious diseases of the European Mobile Lab project have been deployed on the ground, with a mobile laboratory unit to help accelerate diagnoses. © EMLab, European Commission DG ECHO, EU Humanitarian Aid and Civil Protection. CC BY-ND 2.0 via European Commission DG ECHO Flickr. Fairness requires treating others as we would like to be treated ourselves. A way of thinking about what is fair is to ask what we would want done if we did not know our position under the circumstances at hand. In a classic of political philosophy, A Theory of Justice, John Rawls suggested the thought experiment of asking what principles of justice we would be willing to accept for a society in which we were to live, if we didn’t know anything about ourselves except that we would be somewhere in that society. Infectious disease confronts us all with an actual possibility of the Rawlsian thought experiment. We are all enmeshed in a web of infectious organisms, potential vectors to one another and hence potential victims, too. We never know at any given point in time whether we will be victim, vector, or both. It’s as though we were all on a giant airplane, not knowing who might cough, or spit, or bleed, what to whom, and when. So we need to ask what would be fair under these brute facts of human interconnectedness. At a minimum, we need to ask what would be fair about the allocation of Ebola treatments, both before and if they become validated and more widely available. Ethical issues such as informed consent and exploitation of vulnerable populations in testing of experimental medicines certainly matter but should not obscure that fairness does, too, whether we view the medications as experimental or last-ditch treatment. Should limited supplies be administered to the worst off? Are these the sickest, most impoverished, or those subjected to the greatest risks, especially risks of injustice? Or, should limited supplies be directed where they might do the most good—where health care workers are deeply fearful and abandoning patients, or where we need to encourage people who have been exposed to be monitored and isolated if needed? These questions of fairness occur in the broader context of medicine development and distribution. ZMAPP (the experimental monoclonal antibody administered on a compassionate use basis to the two Americans) was jointly developed by the US government, the Public Health Agency of Canada, and a few very small companies. Ebola has not drawn a great deal of drug development attention; indeed, infectious diseases more generally have not drawn their fair share of attention from Big Pharma, as least as measured by the global burden of disease. WHO has declared the Ebola epidemic an international emergency and is convening ethics experts to consider such questions as whether and how the experimental treatment administered to the two Americans should be made available to others. I expect that the values of reciprocity and fairness will surface in these discussions. Let us hope they do, and that their import is remembered beyond the immediate emergency. Headline Image credit: Ebola virus virion. Created by CDC microbiologist Cynthia Goldsmith, this colorized transmission electron micrograph (TEM) revealed some of the ultrastructural morphology displayed by an Ebola virus virion. Centers for Disease Control and Prevention’s Public Health Image Library, #10816 . Public domain via Wikimedia Commons. Leslie P Francis holds joint appointments in law and philosophy, where she holds the ranks of Distinguished Professor of Law and Philosophy, Alfred C. Emery Professor of Law, and Associate Dean for Faculty Research and Development in the College of Law. 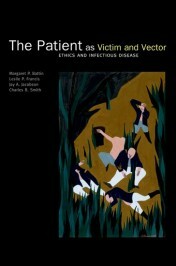 The Patient as Victim and Vector is jointly written by Margaret P Battin, Leslie P Francis, Jay A Jacobson, and Charles B Smith at the University of Utah with expertise in bioethics, health law, and both clinical practice and public health policy concerning infectious disease.